The underlying concepts addressed by Wonder Park are more sophisticated than the treatment they receive in this animated film (which has been developed as a pilot for a new Nickelodeon TV series). However, with plot elements that echo The Wizard of Oz and A Monster Calls, the movie eschews the traditional (and simplistic) animated story arc as it explores the power of imagination and innovation to overcome grief and other personal areas of "darkness." The villain is existential - the shadows that lurk deep within us and occasionally threaten to break out with the introduction of sadness and tragedy. Because the target audience is young kids, the movie neuters these concepts, masking them with a narrative that often veers in cartoonish directions. 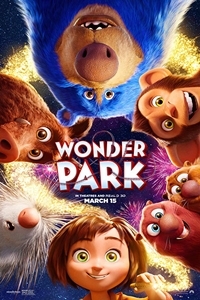 Unlike the best Pixar films (with Inside Out coming immediately to mind), which find ways to appeal equally to adults and children, Wonder Park shows less ambition. Older viewers are more likely to appreciate the film's intentions than fully embrace the story and its characters. Kids, on the other hand, will probably enjoy the frenetic action sequences; plucky heroine; cute, talking animals; and colorful visual representations. June (Brianna Denski) is a young girl with a vivid imagination. Every night at bedtime, she and her mother (Jennifer Garner), bond while exploring new additions to "Wonderland," a magical theme park they have invented. Wonderland is an amazing place, consisting of towering roller coasters and gravity-defying rides and populated by talking animals like Peanut the monkey (Norbert Leo Butz), Boomer the Welcome Bear (Ken Hudson Campbell), Greta the wild boar (Mila Kunis), and Steve the porcupine (John Oliver). Hakuna matata, indeed. June is so enraptured with her vision of the park that she wants to make it real - an endeavor that creates turmoil in the neighborhood when the homemade rides turn out to be unsafe and unreliable. June's safely cocooned childhood is split open by the news that her mother, stricken with a serious illness, must go away to a distant hospital for treatment. June is left behind with her father (Matthew Broderick), who becomes concerned when she withdraws from her imaginary world and stops playing with her friends. One day, on the way to a summer math retreat, June is separated from the other campers and wanders into a nearby forest. There, buried under vines, weeds, and other forms of overgrowth, she discovers something amazing: a real-life Wonderland, sadly neglected but matching the park of her imagination - right down to the talking animals. However, a darkness has come over Wonderland and it's up to June, as the creator, to find a way to repair the damage and drive away the whirling storm cloud that threatens to tear apart what remains of the park. When one considers the quality of animation and the level of voicework, it's apparent that Wonder Park isn't on the same level as a Disney release. Nevertheless, considering the film's modest budget, it looks good. The color palette is bright and, although the character designs are uninspired (with June's wide, circular eyes looking like they were borrowed from manga), the park is full of nice visual touches. The voice work is competent but non-descript, reminiscent of how Disney dubbed the Miyazaki films back in the 1990s and early 2000s. Without a traditional bad guy, the movie faces a narrative conundrum in keeping young viewers involved. The filmmakers (there are four directors, with the trio of David Feiss, Clare Kilner, and Robert Iscove brought on board when Dylan Brown was fired) solved the problem by sending the characters on a variety of wild rides and creating an army of "zombie" stuffed toys to chase the protagonists around. Strangely, however, even though almost the entire second half of the film transpires within Wonderland, the park never seems fully realized or explored. When it comes to evoking a wave of nostalgia for these ultimate places of play and make-believe, the Jurassic Park/World movies did a better job. At times, Wonder Park feels like a square peg in a round hole. It tries something very different from the average kid-focused film and that's not necessarily a bad thing, but the decisions to "play it safe" and dumb down some of the deeply introspective aspects keep it from greatness. Sufficiently diverting to engage kids for about 85 minutes, it can function as an appetizer to an upcoming slate of high-profile Disney titles.